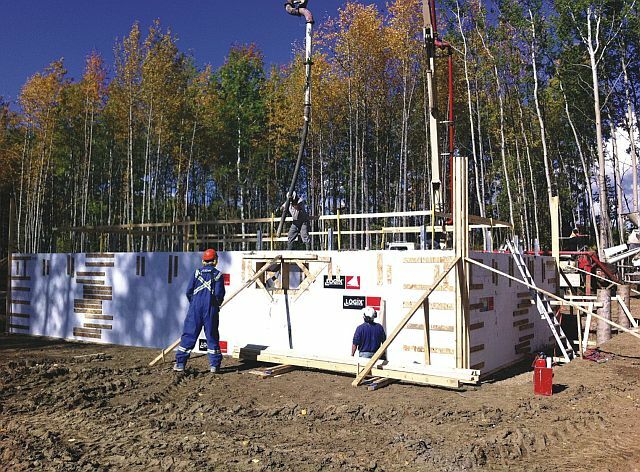 Construction of one of the houses at Gift Lake Metis Settlement that started last fall. Another style of bungalow duplex at East Prairie Metis Settlement with the exterior shell complete. 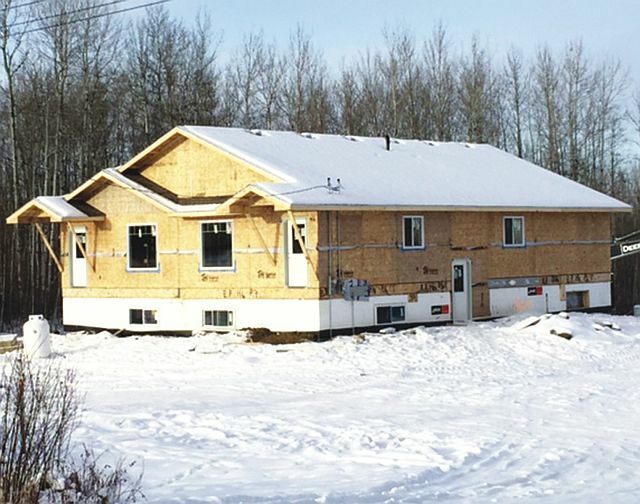 Much-needed new housing is under construction in East Prairie Metis Settlement and Gift Lake Metis Settlement with Habitat for Humanity as volunteers are being recruited to cut costs. “Housing is a real serious problem here at East Prairie, we have a lack of housing,” says Gerald Cunningham, chairperson of the settlement council. Homes for six families continue under construction with three duplexes, which various styles, with work expected to be complete by summer, Cunningham says. “Through partnerships between Habitat for Humanity Edmonton, Metis Settlements General Council, East Prairie Metis Settlement, Gift Lake Metis Settlement and the Government of Alberta, members of the East Prairie and Gift Lake will be able to own a home on the settlement,” says Alfred Nikolai, president and CAO of the international, non-governmental, and nonprofit organization, which was founded in 1976, a self-described “Christian housing ministry,” that addressed the issues of poverty housing. Construction actually started last summer in East Prairie for three duplexes of various styles and last fall in Gift Lake for six single detached houses. “We are looking forward to the homes being completed,” says Gift Lake council chairperson Howard Shaw. “We haven’t had new housing built in our settlement for years. Cunningham notes that the Metis Settlements General Council plans to establish its own housing authority to add more housing under the same guidelines as Habitat for Humanity. The housing organization is delighted to be part of the project to help the settlements with a crucial need. “This partnership will result in affordable home ownership for six deserving Metis families on each settlement,” Nikolai says. With projects at various stages of construction, co-ordinators are seeking volunteer to work on the sites as a way to cut expenses. “Cost of a Habitat project is relative to the number of volunteers and donors for each project,” Nikolai says. All training, tools, and safety equipment is provided by HFHE. Anyone wishing to volunteer in East Prairie may phone Delores Peterson at 780-316-9313, and for Gift Lake, phone Linda McLeod at 1-587-283-0690. All homes are currently at the rough-in stage, and we anticipate that the homes will be completed this summer, with the families moving in once the homes are complete. Partner families purchase the homes from Habitat for Humanity with 500 hours of sweat equity (volunteer work) and then pay an interest-free mortgage with payments that do not exceed 25 percent of their household income. Habitat homes do not come furnished (with the exception of a stove and refrigerator). Families take pride in making the home “their own” and furnish it accordingly, Nikolai says. The local projects began when settlement councils applied to the Metis Settlements General Council (MSGC), which has eight Settlements in Alberta. Applicants were reviewed and awarded by a selection committee of the general council. Families were selected by Habitat for Humanity by applications, with a set of standards, that the household income range from $25,000-$90,000, with at least one child under-18 living in the home.